Las Vegas and Henderson, NV are renowned for amazing golf courses designed by the top architects in golf course design. Put these challenging courses together with fabulous country clubs and our southwest climate and you have luxurious lifestyles at their best. Many of the country clubs have established tennis programs with full-time tennis pros, pro shops and member tennis events. Most of the country clubs also have USTA League teams that have won championships at the District, Sectional and National levels. Built by Del Webb and Pulte in the early 2000’s, Anthem Country Club is one of the jewels of Henderson, NV. Situated high up on Black Mountain, Anthem Country Club enjoys incredible views of the Las Vegas valley below. 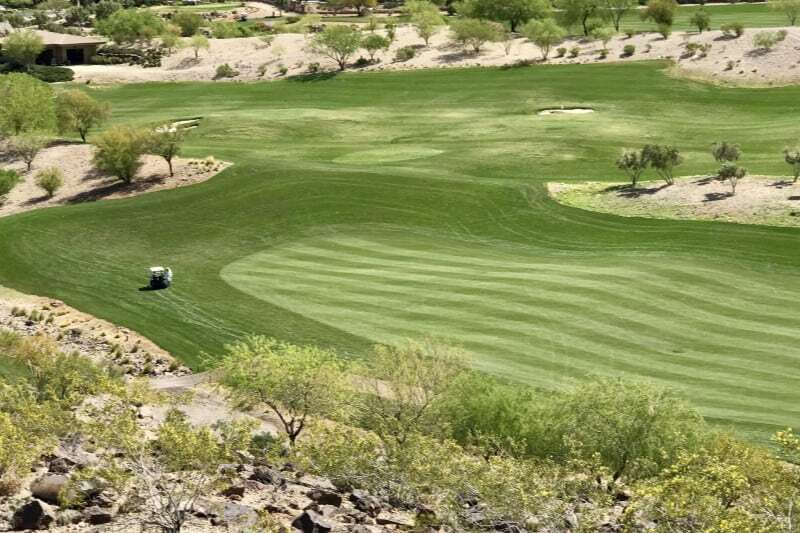 The guard gated country club neighborhood was designed to blend with the surrounding natural lava stone and rugged desert landscape resulting in a truly beautiful experience for the eyes. There are approximately 1600 semi-custom and custom homes within the country club many of which have frontage onto the acclaimed Hale Irwin/Keith Foster 7291-yard par 72 private course. There are two clubhouses, the fitness center and the golf club house. There is an active tennis community at Anthem CC with six lighted tennis courts, full-time tennis pros and many USTA league teams. Social and Golf Memberships are available separate from the Anthem CC HOA fee. The gorgeous lava rock terrain mixed with the green fairways and common areas. Canyon Gate is a guard gated neighborhood built around a private 72-par golf course designed by Ted Robinson incorporating many water hazards including lagoons and waterfalls. It has a chaming country club with golf pro shop and casual and fine dining. It also has an outdoor heated pool, five lighted tennis courts and tennis pro shop. Most of the properties are custom homes with golf course frontage but there are also condos and smaller single family residences available. Canyon Gate Country Club is centrally located and close to Boca Park shopping and Downtown Summerlin. Nearby popular restaurants include Flemings Steakhouse, Outback Steakhouse, Brio Tuscan Grill. The central location and charming traditional clubhouse. This relatively new, Mediterranean inspired community is located very near Lake Mead in the east part of the valley. Within the master plan of Lake Las Vegas is the beautiful guard gated South Shore neighborhood with a wide variety of home types including upscale condominiums, golf villas, semi-custom homes and grand custom homes overlooking the lake. This exclusive neighborhood is centered around the first private Jack Nicklaus Signature course in Nevada. A 71-Par course, South Shore is challenging with amazing views of the lake, the mountains and an occasional Big Horned Sheep. The resort feel and amazing views of Lake Mead. Massive, modern custom homes on elevated lots are the norm at MacDonald Highlands with relatively few semi-custom Toll Brothers production homes built in this prestigious community. Centered around the challenging and private Dragon Ridge Country Club, MacDonald Highlands is truly exclusive and delightful. In 2017 Dragon Ridge Golf Course was voted a Top 10 Golf Course in Nevada by Golf Digest and was voted Best Golf Course by the Review Journal “Best of Las Vegas”. Dragon Ridge golf memberships are available separately. I love the stunning Dragon Ridge Club House and tennis facility. 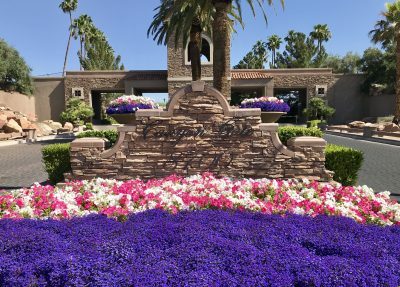 With semi-custom homes built by Sun Colony and Toll Brothers and another exclusive area of only custom homes, Red Rock Country Club is one of the premier guard gated golf course communities in the Las Vegas valley. It is situated at the entrance of Red Rock Canyon within the Summerlin master plan on the west side of the Las Vegas valley. Named after nearby Red Rock Canyon, this popular country club has two golf courses, one public and one private, nine lighted tennis courts including a stadium court, a fitness and spa complex and a main clubhouse that has amazing city views and also of it’s namesake, Red Rock Canyon. Semi-custom production homes range from 2000 sf to 5500 sf many with amazing mountain or city views. Within the country club with it’s own second gate are the Estates at Red Rock Country Club with custom homes ranging from 4000 sf to over 15,000 sf. Red Rock Country Club has a very active social calendar from wine dinners to movie nights on the fairways. There is childcare facility for members who have a tennis match, spa appointment or golf lesson. There is an active tennis community at Red Rock Country Club with nine lighted tennis courts including a stadium court, full-time tennis pros, a pro shop and many USTA league teams. Fitness, Tennis and Golf Memberships are available separate from the Red Rock Country Club HOA fee. The excellent menu and cuisine and the tennis courts. 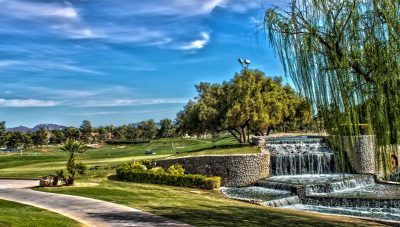 The first fully walled and guard gated private country club in the valley, Spanish Trail is still a highly respected community of 11 neighborhoods ranging from condos, and villas to semi-custom and vast custom estates. There are approximately 1200 properties on 640 acres and the centerpiece is the Robert Trent designed 27-hole golf course that can be played three different ways. The country club and golf require a separate membership but the fitness facilities, nine tennis courts including a stadium court and pools are available to all residents. It is a classic neighborhood and is an oasis of lush green mature landscaping. Located in South Summerlin on the western rim of the valley, The Ridges has the highest concentration of custom homes in Las Vegas. At around 3200 ft elevation, many properties have panoramic views of the entire valley. There are eight custom home neighborhoods and five semi-custom home neighborhoods each with its own neighborhood gate. The architecture at The Ridges is “Desert Contemporary” with extensive use of glass and stone. The Jack Nicklaus designed Bear’s Best Golf Course winds through the natural arroyos surrounding the ridges that this community is named after. There are two custom home neighborhoods still building, Azure and Indigo. And there are three semi-custom neighborhoods with availability: Sterling Ridge, Silver Ridge (both William Lyons) and Fairway Pointe townhomes (Toll Brothers). Club Ridges is the community clubhouse with a fitness center and classes, an outdoor pool and spa and five lighted tennis courts. That the Club Ridges amenities are included in the HOA fee and are available to all homeowners at no extra charge! The Estates is comprised of several wonderful neighborhoods surrounding the Southern Highlands Golf Course which was co-designed by Robert Trent Jones Sr. and Robert Trent Jones Jr. The SHGC clubhouse is spectacular with wood beamed ceilings and extensive use of stone. This is a very private and exclusive club with limited membership. The homes are custom and semi-custom and within the guard gated walls there are over 13,000 trees. There are tennis courts, an impressive 13,000 sf spa and club restaurants for members. I love the Mediterranean inspired architecture and the quick commute to the airport.